1. It is breathtakingly expensive. 2. It exhibits periods of neck snapping volatility exposing the trader to substantial losses if he gauges the direction wrong and does not act quickly. For the investor who is willing to learn an option based approach, both these problems can be easily dealt with by using structured option trades to control risk crisply and make efficient use of capital. Because this underlying is such an actively traded stock, the options are extremely liquid and trade with very tight bid / ask spreads. These are the two essential characteristics for selecting an appropriate vehicle in which to trade options. 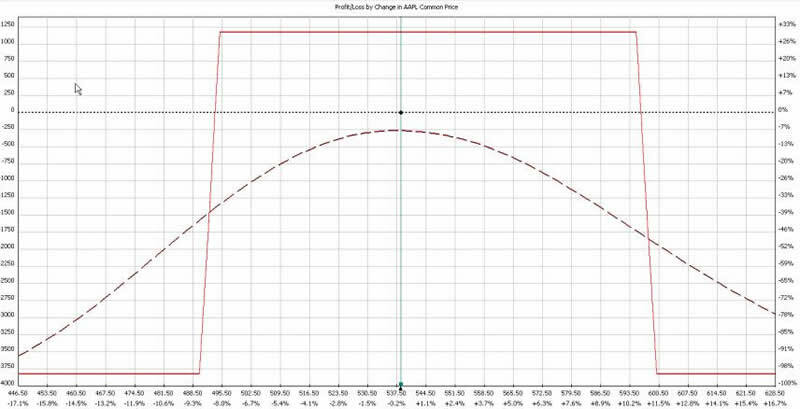 The horizontal orange lines represent the price boundaries of the option trade we will consider. The lines have been placed to coincide with areas of recent support and resistance. The lines are obviously placed somewhat subjectively and can be modified to reflect the nuances of the reader’s technical analysis biases. The point of the thought process I want to lay out here is not to debate the exact placement of these lines, but to demonstrate how a high probability trade can be constructed using whatever technical methods you wish to use to determine areas of support and resistance. The next point we need to discuss is the concept of a “vertical credit spread”. 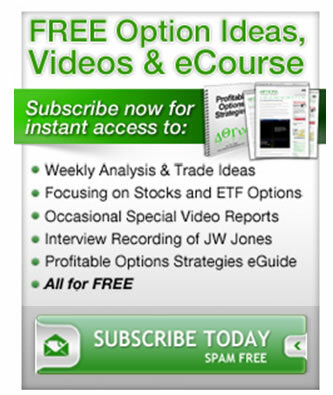 This is, as implied by the name, an options spread in which a credit is received into the trader’s account. The spread is constructed in either calls or puts, and represents a bearish or bullish trade respectively. An example of a bullish trade, a vertical put credit spread, would be to sell the AAPL 490 strike put in June and buy the 485 strike. The result of entering this trade would currently be a credit of $60 for each contract and the full value of this contract would be realized if AAPL closed at 490 or above at June expiration. No additional profit is possible for this trade. The position has a maximum potential loss of $440 because we own the long put. A similar bearish trade can be established using a vertical call spread. In this example, the June 595 call could be sold and the June 600 call bought for a net credit of $45 per contract. This is the absolute maximum profit that can be made from the position. 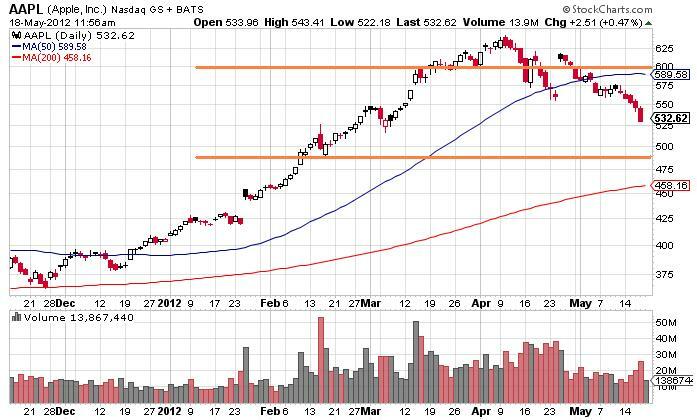 The full value of the position would be realized if AAPL closed at 595 or below at June expiration. The position has a maximum defined risk of $455 because we own the long call. The astute reader will now undoubtedly ask the question: Why would anyone take a trade where he could make $45 and lose $455? The answer lies in the probability of realizing the profit. At current prices, each of these credit spreads has an 88% probability of achieving its maximum profitability. The illustrated trade has a return of 31% on margin requirements and a probability of being profitable of 72%. Because it is a credit spread, the trade has no direct cost, but does have margin encumbrance requirements to secure the ability to enter the trade. An important point is that only one side of the trade requires margin since it is clearly not possible to lose on both sides of the position. It is critical to confirm that your broker only requires margin on one side; a few “option unfriendly” brokers require margin on both sides. If you find your broker is one of these dinosaurs- run, don’t walk away since that illogical requirement halves the potential return on the position. This is but one example of using options to construct a high probability trade that is profitable over a wide range of price and uses capital efficiently. In addition, risk is crisply defined and accounts cannot be “blown up” by Black Swan events.